During the period between 2004 and 2014, funding for the purchase of antiretrovirals (ARVs) in the Dominican Republic was falling in Global Fund to Fight AIDS, Tuberculosis and Malaria (Global Fund) projects. The US President’s Emergency Plan for AIDS Relief (PEPFAR), through the local mission of the US Agency for International Development (USAID), allocated small amounts of emergency resources to cover frequently recurring stock-outs. The resources assigned by these agencies to make purchases was reduced between 2010 and 2011 without a corresponding increase in resources from the Dominican government, despite a foreseeable annual growth in the number of patients on antiretroviral therapy (ART) of approximately 38%. In 2012, the accumulation of these factors began to have negative repercussions on the availability of ARVs in health care facilities (figure 1). In 2012, resources from the Global Fund were reduced by 31%, dropping from USD 5.7 million in 2011 to USD 3.9 million in 2012. The National Pharmaceutical Management Unit (La Unidad Nacional de Gestión de Medicamentos) of the Ministry of Public Health (Ministerio de Salud Pública, or MSP) and the National Council on HIV and AIDS (Consejo Nacional para el VIH y el SIDA, or CONAVIHSIDA), with technical assistance from the Systems for Improved Access to Pharmaceuticals and Services (SIAPS) Program of USAID, conducted an analysis to determine the financial gap that needed to be covered by national resources. It was determined that USD 2.5 million, in addition to the resources already programmed by the Global Fund, would cover the Global Fund’s reduced donation, the annual increase in the number of patients, and a safety stock of ARVs that had not been considered in previous estimates. The production of these estimates was followed by review and discussion meetings with government entities and aid agencies to validate the data and establish strategies for closing the financial gap. The presentation and discussion of the data and a combination of political advocacy efforts coordinated by CONAVIHSIDA and the MSP allowed the gap to be closed and provided a budget surplus to be used for the acquisition of diagnostic tests and other supplies. Thirty-nine percent (USD 975,000) of the gap was covered by a reduction of the purchase price of ARVs, resulting from a change of supplier. The remaining 61%, and a small surplus, resulted from the allocation of USD 1.9 million by the MSP for the purchase of ARVs. The planning and allocation of these resources would not have been possible without an analysis of the financial gap that needed to be bridged by public resources. In 2013, the resources planned for the purchase of ARVs corresponded with the allocated budget. The increase in resources and better price negotiations allowed the acquisition of a greater quantity of ARVs and a boost in their availability to over 90% in 2014 (figure 1). Because of the success of this technical assistance intervention, SIAPS supported similar financial analyses in 2014 and 2015. In 2014, the planned budget was increased by 40%, going from USD 6.4 million to USD 9.7 million, owing to the inclusion of estimates for diagnostic tests, clinical monitoring tests, and supplies for the vertical transmission program. The resources allocated by the Global Fund remained stable. 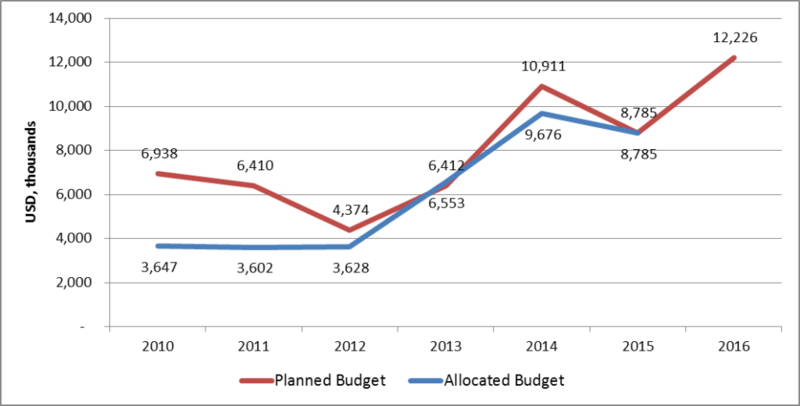 The difference was covered by resources from the Dominican government, which tripled its budgeted allocation, going from USD 1.9 million in 2013 to USD 6 million in 2014 (figure 1). As of 2014, funds from PEPFAR were not needed to cover potential stock-outs. The availability of ARVs remained at high levels, as shown in figure 1. In 2015, the planned budget was reduced in relation to the previous year because additional products were not considered in planning and the safety stock had been adequately supplied in prior planning. The planned resources dropped to USD 8.7 million (figure 2). That year the Global Fund did not plan to provide resources for the purchase of medicines and supplies, so all of these needs were included in and allocated by the MSP budget. The availability of ARVs remained at high levels. In 2015, plans were made for purchases to be made in 2016. The total planned was USD 12.2 million, taking into account extension of coverage to 38,000 patients undergoing ART (an increase of 28% from 2015) as part of an ongoing implementation of recommendations from the World Health Organization and UNAIDS[i] (figure 3). Greater savings from better price negotiations are not anticipated, and international aid resources will not be obtained to support purchases. Therefore, the MSP will have to arrange for the USD 12.2 million to be included in the national budget in 2016. [i] By 2020, 90% of people living with HIV will be aware of their condition, 90% of people diagnosed with HIV will receive ART, and 90% of those who receive ART will obtain viral suppression. Valdez C, Barillas E, Castillo M. 2015. Success Story: Funding of ARVs in the Dominican Republic. Presented to the US Agency for International Development by the Systems for Improved Access to Pharmaceuticals and Services Program (SIAPS). Arlington, VA: Management Sciences for Health.